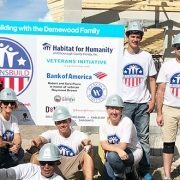 TAMPA, FL, September 14, 2018 – When the roof trusses are raised by MetLife volunteers the morning of September 15 it will signify the beginning of another home build for a low-income Hillsborough County family. It will also mark the visible beginning of a partnership for MetLife Foundation and Habitat for Humanity of Hillsborough County to further Habitat’s mission of providing affordable homeownership opportunities that help stabilize low-income families. 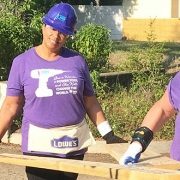 The MetLife Foundation-sponsored home in north Tampa will be built for Teshia Lundy and her daughter, who will be working alongside volunteers for the official opening of the construction site to volunteers. Earlier in August, MetLife Tampa executives presented a $70,000 check to Habitat Hillsborough CEO Tina Swain to underwrite construction costs related to the build. In addition to the funding commitment, MetLife Tampa will also field several employee teams who will volunteer on the home build site during varying phases of construction. 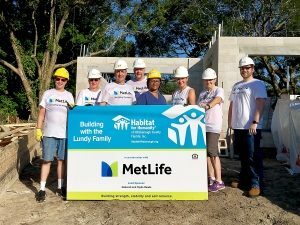 Over the course of the build, MetLife anticipates having approximately 150 volunteers, amassing nearly 1,200 hours, assisting with construction. Lundy, employed as a file clerk and currently living in a small apartment in a high crime neighborhood, is also considered a partner with Habitat Hillsborough for the home build. She is currently working to complete 300 sweat equity hours on the Habitat build sites in lieu of a down payment and attending 10 homeowner preparation classes as required by her agreement with Habitat Hillsborough. Upon completion of construction and her program requirements, Lundy will purchase her affordable home mortgage before moving into the home with her daughter. The Lundy home will be built on Meridel Drive in north Tampa on land donated to Habitat Hillsborough by Deborah and Clyde Reade. The anticipated construction completion date is November 17th. A date for the home’s dedication and key presentation ceremony will be announced in early November.